The Judicial Service Commission (JSC) will today meet striking judges and magistrates in a move aimed at resolving the stand-off over salary increment that has brought work at most courts in the country to a standstill. 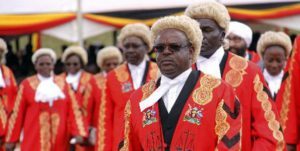 A source from the Judiciary intimated to PML Daily that the JSC leadership will today meet the Uganda Judicial Officers Association (UJOA) executive and chart ways of salvaging the situation. Retired Justice Benjamin Kabiito, the JSC chairperson is optimistic that the meeting will find a lasting solution to the judges’ grievances. Judicial officers countrywide laid down their protesting what they term as poor renumeration. The strike followed a 30-day ultimatum that the judges gave to the government to address their grievances. The judicial officers want their salaries increased to match with those of other officials in the other arms of government. They also want, among others, housing allowances, medical insurance, motor vehicles and improved security. The government recently increased salaries of state prosecutors two days after they laid down their tools in protest against poor pay. The lowest officer now earns Shs3.5 million up from Shs550,000 while the Director of Public Prosecutions (DPP) Justice Mike Chibita now earns Shs26.5 million.